This page lists the translations of names and other terms used in Breath of Fire. The left column is the original Japanese translation, the second is the Romaji pronunciation, the third column lists an accurate and/or literal English Translation and the fourth column lists the English Squaresoft (or Capcom USA in a few instances regarding the GBA port) translation. Zack "Ryū" in Japanese can be translated into "Dragon". The original SNES release has no default name for the main character, this was first included in the GBA port. ギリアム Giriamu Gilliam Bo Together with Terry (the son of the Forest Clan's chief), they form the name of comedian Terry Gilliam. マニーロ Maniiro Manillo Gobi The first part of his name is Japanese for "Money" (マニー), in reference to the character’s greediness. ディース Diisu Dís Bleu Named after the Dís, a spirit or deity associated with fate in Norse mythology. Translated "Deis" in Breath of Fire III and Breath of Fire IV. モグ Mogu Mogu Mogu Short for “mogura”, which means "mole” in Japanese. Rai Sr-1 Renamed in the GBA port in reference to Sieg and Raifel, two Wyndian soldiers from the Princess of the Wings manga. ジュダス Judasu Judas Jade His Japanese name comes from the Biblical Judas. テリー Terii Terry Terry Together with Gilliam, they form the name of comedian Terry Gilliam. ロズオータ Rozuoota Rosewater Ross Named after the main character in Kurt Vonnegut's novel, God Bless You, Mr. Rosewater. タイフーちゅん Taifuuchun Chirphoon TyphoonBug Its name is a portmanteau of the onomatopoeia for a bird’s chirping and “Typhoon”. してんのうカーラ Shitennou Kaara Karla of the Four Devas Cerl The Four Devas refers to a group of Buddhist deities, and has become a popular term for four-man teams in fiction. モギばあさん Mogi Obasan Grandma Mogi N/a The three old women looking after the sleeping Mogu. They had names in the Japanese version which were removed in the localization. アニマ Anima Anima Anne Anima is a concept from Carl Jung's school of psychology, and refers to the female inner personality within a man's consciousness. せいれい Seirei Spirit N/a Refers to the spirit that watched over the SkyKey and was trapped in Mote's nightmare. ミリア Miria Myria Tyr In English, named after the god of war from Norse mythology, despite the god in question being male. The name may have been chosen due to it meaning “god” in Old Norse, however. りゅうのかみ Ryuu no Kami Dragon God Dragon Lord Also translated as Ladon in Breath of Fire III. ファイアパピー Faiapapii Fire Puppy FlmDr "Puppy" was also translated as Whelp in Breath of Fire III. カイザードラゴン Kaizaadoragon Kaiser Dragon Rudra Named after the German word for "Emperor", while the English name refers to a deity from Hindu mythology. さいごのちから Saigo no Chikara Ultimate Power Agni In English, named after the deity of fire in Hindu mythology. シャイアン Shaian Cheyenne Shin Named after the Chevrolet K-5 Blazer Cheyenne SUV. デボ Debo Debo Debo Possibly named after the Debo series of traincars. ランクル Rankuru Lancru Doof Lancru is a shortened form for Land Cruiser, and a popular nickname in Japan for the Toyota Land Cruiser SUV. リーパー Riipaa Reaper Flea Also translated as "Thrasher" in Breath of Fire III. ビルブル Biruburu Bill Bull Bulla Possibly named after the Final Fight enemy of the same name. サンダークライ Sandaa Kurai Thunder Cry Gloom Also translated as "Volt" in Breath of Fire III. ガンヘッド Ganheddo Gunhead Beak Also translated as "Gonghead" in Breath of Fire II, III, and IV. リザードマン Rizaadoman Lizardman Zard Also translated as "Kimoto" in Breath of Fire II. マイコニッド Maikoniddo Myconid Stool Named after a creature from the Dungeon and Dragons role-playing game. Also translated as "Meedid" in Breath of Fire II. オーク Ooku Orc WarHog Also translated as "Ogre" in Breath of Fire II. ベルゼブ Beruzebu Beelzebu Fly "Beelzebub" is one of the names for the devil, and the monster's fly appearance is in reference to one of its depictions being a demonic fly. トレント Torento Treant Tronk A treant is a tree-like monster from the Dungeon and Dragons role-playing game. らいじゅう Raijuu Raiju Bully Named after an electric creature from Japanese mythology. スカルピオ Sukarupio Skullpio Scorp The Japanese name is a portmanteau of "skull" and "Scorpio." サボ Sabo Cact Prickle The Japanese name is short for "saboten," the Japanese word for cactus. キサボ Kisabo Tree Cact Cactus As this enemy is a brown/beige palette swap, it's assumed the "ki" in its name is in reference to the kanji for "tree/wood" (木). バラクーダ Barakuuda Barracuda Dogfish Named after a type of aggressive fish. アンモン Anmon Ammon Tentacle Its Japanese name is likely a shortened form of "Ammonoids", an extinct group of marine mollusks which this enemy resembles. どうらくガニ Dourakugani Joyful Crab Crab Named after the very popular, crab-specialized restaurant chain "Kani Douraku". ホムンクルス Homunkurusu Homunculus Rogue A Homunculus refers to a man-made human being, described in alchemy writings from the 16th Century. リリフライ Ririfurai Ririfly Buzzer The Japanese name is a portmanteau of Ririfu and fly. クロムデンデ Kuromu Dende Chrome Dende Nautulis The Japanese name is likely a shortened version of "dendenmushi," the Japanese word for snail. Its English name is a misspelling of "Nautilus", a species of marine mollusk this enemy resembles. サラセニアン Sarasenian Sarracenian Flower Named after a monster from Kamen Rider, itself named after a genus of plants. おおめだま Oomedama Big Eyeball ICU The English name is pronounced "I see you." プチオーム Puchi Oomu Petit Ohmu Crawler Named after the creature from the anime movie Nausicaä of the Valley of the Wind from Studio Ghibli. ブリーブ Buriibu Bleeb Frog The Japanese name refers to a frog-like enemy from the Wizardry RPG series. てしたウゾー Teshita Uzoo Subordinate Uzo Morte Uzomuzo is a Japanese idiom that means "a group of worthless people." ぽち Pochi Pochi Pog "Pochi" is a common name for dogs in Japan. バックベアード Bakkubeaado Back Beard EyeSpy Back Beard is the leader of the Western Youkai in the manga GeGeGe no Kitarō. しにがみ Shinigami Shinigami Morteo A shinigami is a Japanese supernatural spirit loosely equivalent to the Grim Reaper. コカトリス Kokatorisu Cockatrice GrimFowl Named after a mythical European creature. Also translated as "Cotris" in Breath of Fire II. デビマンダー Debimandaa Devimander HornToad The Japanese name is a portmanteau of "devil" and "salamander." ミリア Miria Myria Goddess All three forms of the final boss share the same name. セントネイル Sentoneiru Saint Nail Talon As all dragon test monsters seem to carry a double meaning, Talon's Japanese name may be a pun on the Japanese pronunciation for Sentinel (センチネル, senchineru), Saint and nail (as the sprite has sharp talons), but it could also refer to a Christian saint and martyr. セントエルモ Sento Erumo Saint Elmo Bain As all dragon test monsters seem to carry a double meaning, Bain's Japanese name may refer to the atmospheric St. Elmo's fire (given the monster's fiery appearance), but it could also refer to Christian saint and martyr Erasmus of Formia, who is also known as "Saint Elmo". セントクイナ Sentokuina Saint Quina Avian As all dragon test monster seem to carry a double meaning, Avian's Japanese name may refer to the water rail bird (whose Japanese name is Kuina) given the monster's bird appearance, but it could also refer to a Christian Saint and martyr like Saint Quintus. ペット Petto Pet PET An unused and incomplete enemy, trying to force a battle through hacking will freeze the game before the battle begins. Its silhouette is briefly seen before crashing, and its shape resembles the body/leg sprite used for Pog and Cerl. たんけん Tanken Short Sword Dirk The dirk is a long thrusting dagger used by sailors and Scottish officers. やまがたな Yamagatana Machete Sabre The name (lit. "Mountain Katana") is used to refer to the Machete sword, or alternatively the woodman's hatchet. そりみのけん Sorimi no Ken Cutlass Scythe "Sorimi" (反り身) is a Japanese term referring to strutting or thrusting one's chest out proudly, and in Japan it became associated with swashbuckling (braggart and showy) pirates through literature. When used to speak about swords it is often used interchangeably with cutlass, a curved sword famously used by pirates. こうていのつるぎ Koutei no Tsurugi Emperor Sword EmporSD Also translated as "EmpireSD" in Breath of Fire II and "Royal Sword" in Breath of Fire III and IV. あしゅらのけん Ashura no Ken Ashura's Sword MystSD The Asura are beings from Indian and Persian mythology. Also translated as "GoblinSD" in Breath of Fire II. Foil (GBA) Curiously, both the saber/sabre and foil are fencing swords. ちょうのレイピア Chou no Reipia Butterfly Rapier PowerRP The "Power" in the English name likely came from interpreting chou as "super/ultra" (超), rather than "butterfly" (蝶). Butterfly is more likely, since the official art shows that it has a butterfly-shaped hand guard. ダガー Dagaa Dagger Dagger Also translated as "WoodenDR" in Breath of Fire II. 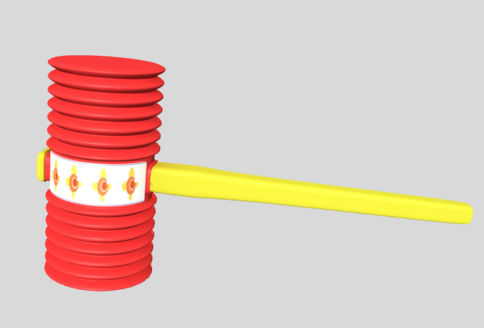 ピコピコハンマー Pikopiko Hanmaa Picopico Hammer Mallet A Picopico Hammer is a popular type of toy hammer in Japan. Note: All unused weapons, armors, helmets and shields in the English version lack proper names, showing a blank space when hacked into the inventory. ダミー Damii Dummy There are three weapons with this name, one only Ryu can use and the other two only Bleu can use. みんなのぶき Minna no Buki Everyone's Weapon As the name indicates, this weapon can be wielded by all eight characters. タイトミニ Taito Mini Tight Mini Gown Also translated as "Short Skirt" in Breath of Fire IV. てつのむねあて Tetsu no Muneate Iron Breastplate PlateAR Also translated as "IronML" in Breath of Fire II and "SteelBPlate" in Breath of Fire IV. ひょうがのよろい Hyouga no Yoroi Glacier Armor IcyAR Also translated as "FrozenAR" in Breath of Fire II. まかいのローブ Makai no Roobu Netherworld Robe EvilRB Makai (魔界, lit. demon world) is often used as a synonym for Hell in Japan. くさりかたびら Kusari Katabira Chain Mail ChainML Also translated as "Chain Cap" in Breath of Fire III and IV. クオーツチェスト Kuootsu Chesuto Quartz Chest QuartzAR Quartz is a type of mineral gem. てんしのむねあて Tenshi no Muneate Angel Breastplate AngleAR Also translated as "Angel's Vest" in Breath of Fire IV. どうしのコート Doushi no Kooto Taoist Coat GuruCT Doushi (道士) literally means Taoist/Daoist Priest, a follower of the Eastern philosophy known as Taoism. マタギのふく Matagi no Fuku Matagi Clothing HuntCL The Matagi are traditional winter hunters from northern Japan. にじのはごろも Niji no Hagoromo Rainbow Hagoromo ClearCL Hagoromo (feather dress) refers to a specific kind of feathered kimono said to be used by the Tennin, spiritual beings from Japanese Buddhism. Also translated as "RainbowRB" in Breath of Fire II. はちがね Hachigane Forehead Guard Visor Hachigane is a type of Japanese forehead protection. Also translated as "SaladBwl" in Breath of Fire II and "Brass Helm" in Breath of Fire III and IV. フルフェイス Furufeisu Full Face FaceMask Also translated as "Face Guard" in Breath of Fire IV. せいなるスカーフ Seinaru Sukaafu Sacred Scarf MystSF Also translated as "HolySF" in Breath of Fire II. ガラスのドミノ Garasu no Domino Glass Domino Domino Also translated as "GlassRG" in Breath of Fire II. いぬがみのかぶと Inugami no Kabuto Inugami Helmet WolfHT Named after the dog or wolf-like spiritual beings from Japanese mythology. かわのたて Kawa no Tate Leather Shield SuedeSH Also translated as "Cloth Shield" in Breath of Fire III. まもりのたて Mamori no Tate Protective Shield GuardSH Also translated as "CharmSH" in Breath of Fire II. リストバンド Risutobando Wristband Wrist Also translated as "Ristband" in Breath of Fire II. ひょうがのたて Hyouga no Tate Glacier Shield ColdSH Also translated as "Ice Shield" in Breath of Fire III. LavaSH (GBA) Due to an oversight in the SNES version, this item and the Flame Shield were both given the same English name. おおぞらのたて Oozora no Tate Firmament Shield SkySH Oozora (大空) literally means large or vast sky. ゆうきのベルト Yuuki no Beruto Courage Belt Sash Also translated as "HeroBT" in Breath of Fire II and "Titan Belt" in Breath of Fire III. そっこうのくつ Sokkou no Kutsu Instant Shoes Clog Also translated as "FastShoe" in Breath of Fire II. あいのうでわ Ai no Udewa Love Bracelet LoveBR Also translated as "Cupid's Lyre" in Breath of Fire III. RubyRG (GBA) Also translated as "DmndBr" in Breath of Fire II and "Diamond Ring" in Breath of Fire III and IV. ちえのわ Chie no Wa Wisdom Ring SmartRG Also translated as WiseHoop in Breath of Fire II. さおデラックス Sao Derakkusu Rod Deluxe Rod2 Also translated as "DluxRod" in Breath of Fire II and "Deluxe Rod" in Breath of Fire III. たくみのさお Takumi no Sao Skilled Rod Rod5 Also translated as "CharmRod" in Breath of Fire II and "Spanner" in Breath of Fire III and IV. さざえ Sazae Turban Shell Shell Also translated as "Urchin" in Breath of Fire II. タイタンのよろい Taitan no Yoroi Titan Armor Named after the Titan gods from Greek mythology. ヘカトンケイル Hekatonkeiru Hekatonkheir Hekatonkheires are massive, multi-armed giant entities from early Greek mythology. フルプレート Furu Pureeto Full Plate This name is later used in Breath of Fire IV. きのよろい Ki no Yoroi Wooden Armor This item was removed in the GBA port to make space for the S.Armor. かわてぶくろ Kawa Tebukuro Leather Gloves This item was removed in the GBA port to make space for the S.Shld. ヘルヘルム Heru Herumu Hell Helm This item was removed in the GBA port to make space for the S.Helm. きつけやく Kitsukeyaku Stimulant Life Also translated as "LifePl" in Breath of Fire II, "Ammonia" in Breath of Fire III and IV, and "Tonic" in Breath of Fire V.
ばんのうやく Bannouyaku Panacea Life2 Also translated as "CureAl" in Breath of Fire II and "Multimeds" in Breath of Fire V.
ベムのなみだ Bemu no Namida Bem's Tear T.Drop Possibly named after the main character of the old Japanese anime series Humanoid Monster Bem. リフルエキス Rifuru Ekisu Rifuru Extract Cure For consistency's sake, it should be "Cura4 Extract". リフラルエキス Rifuraru Ekisu Rifuraru Extract Cure2 For consistency's sake, it should be "CuraX Extract". Also translated as "Van.Ext" in Breath of Fire II. ちりょくのみ Chiryoku no Mi Wisdom Fruit Acorn Also translated as "WFruit" in Breath of Fire II. パロテイン Parotein Palotein ProtnA Although similar to the word for "Protein" (プロテイン, purotein), it is actually named after Balotein medicine (バロテイン, barotein). スタミナのもと Sutamina no Moto Stamina Source V.Ptn Also translated as "Stamina" in Breath of Fire II. かいしんたん Kaishintan Critical Pill Mrbl1 "Kaishin" (会心) literally means "satisfactory", but its become popular in Japan as a term for critical hits due to its use in the Dragon Quest series. まもりけむり Mamori Kemuri Protective Smoke Mrbl3 Also translated as "Smoke" in Breath of Fire II. クラインのつぼ Kurain no Tsubo Klein Bottle WtrJr A Klein bottle is a theoretical, non-orientable geometrical shape with a single side and no boundaries. やきとり Yakitori Yakitori WMeat Yakitori (lit. "grilled chicken") refers to a type of skewered chicken. こばんがつお Koban Katsuo Koban Bonito Trout The Koban was a small oval coin in circulation during Japan's Edo Period. りゅうぐうまぐろ Ryuuguu Maguro Dragon Palace Tuna Tuna The Japanese name refers to the Ryūgū-jō (lit. Dragon palace castle) from Japanese folklore. のこぎり Nokogiri Saw Saw Nokogiri refers specifically to a kind of Japanese saw which cuts on the pull stroke, unlike most European saws. ききみみずきん Kikimimi Zukin Listening Hood Cowl Kikimimizukin is a Japanese tale in which a fox gives an old man a hood as thanks for helping his son. The hood enables him to hear and talk with both animals and plants. Also translated as "M.Hood" in Breath of Fire II. めいじんのふえ Meijin no Fue Master's Flute Maestro Maestro is a title of respect used in Western classical music and opera, derived from the Italian word for "master"/"teacher". Also translated as "F.Flute" in Breath of Fire II. オリザニン Orizanin Oryzanin Tonic Oryzanin is an old name for thiamine. はがんのつめ Hagan no Tsume Stone-Breaking Claw I.Claw はがん is probably 破岩 in kanji. だいちのうでわ Daichi no Udewa Earth Bracelet N/a Just like unused weapons and equipments, this item shows a blank space when hacked into the English version. ゆうしゃのゆびわ Yuusha no Yubiwa Hero Ring HeroRG Has the same Japanese name as the Ring accessory. つりきちのさお Tsurikichi no Sao Fisherman's Rod Rod3 A fully functional rod equipment, probably unused due to an oversight. とうぞくのうで Touzoku no Ude Thief's Arm Lifter Equipping this item increases the chance for enemies to drop items. やすらぎのみず Yasuragi no Mizu Water of Tranquility ClnWtr Refers to the water from the Ease Cave, probably used before the WtrJr was created. The item is actually mentioned in the script, where it is translated as "Cleansing Water". まほうのばしゃ Mahou no Basha Magical Coach Coach When equipped on Ox and at the lead of the party, the party's overworld sprites change into a purple coach pulled by him. The coach's only benefit is to protect the party from the fumes in the Wilderness inside Mogu's dream. どこでもドア Dokodemo Doa Anywhere Door DrWarp A well-known unused item, the DrWarp allows the player to warp to any area within the game, including unused ones and title/cutscenes screens, although its functionality was removed in the GBA port. 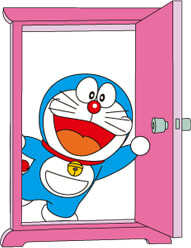 The Japanese name refers to one of Doraemon’s gadgets, a door he uses to go wherever he wants. パダム Padamu Flare Also translated as Spark in Breath of Fire II. パダーマ Padaama Flame Also translated as Fireblast in Breath of Fire III, IV and V.
パドラーム Padoraamu Char Also translated as Fireball in Breath of Fire II and Inferno in Breath of Fire III, IV and V.
レイガ Reiga Frost Also translated as Cold in Breath of Fire II. レイギル Reigiru Ice Also translated as Freeze in Breath of Fire II and Iceblast in Breath of Fire III, IV and V.
グレイゴル Gureigoru IceX Also translated as Hail in Breath of Fire II and Blizzard in Breath of Fire III, IV and V.
バル Baru Spark Also translated as Thunder in Breath of Fire II and Jolt in Breath of Fire III, IV and V.
ババル Babaru Gale Also translated as S.Boom in Breath of Fire II and Lighting in Breath of Fire III, IV and V.
バルハラー Baruharaa Valhalla BoltX Also translated as Myollnir in Breath of Fire III and Thunderstorm in Breath of Fire IV. ガダブレダ Gadabureda 9.5 Also translated as 8.0 in Breath of Fire II and Quake in Breath of Fire III, IV and V.
メガ Mega Bomb Also translated as Simoon in Breath of Fire III and Firewind in Breath of Fire IV. ドメガ Domega NovaX Also translated as Missile in Breath of Fire II, Sirocco in Breath of Fire III, and Simoon in Breath of Fire IV. ワース Waasu Rub Also translated as Death in Breath of Fire II, III and IV. リリフ Ririfu Cura1 Also translated as Cure in Breath of Fire II and Heal in Breath of Fire III and IV. アプリフ Apurifu Cura2 Also translated as Cure 2 in Breath of Fire II and Rejuvenate in Breath of Fire III and IV. ヤクリ Yakuri Heal Also translated as CurePsn in Breath of Fire II and Purify in Breath of Fire III and IV. トプリフ Topurifu Cura3 Also translated as Cure 4 in Breath of Fire II and Restore in Breath of Fire III and IV. リフラル Rifuraru CuraX Also translated as Cure 3 in Breath of Fire II and Vitalize in Breath of Fire III and IV. リバル Ribaru Renew Also translated as Raise Dead in Breath of Fire III and IV. リバルラ Ribarura RenewX Also translated as Resurrect in Breath of Fire III and IV. レクタ Rekuta Sap Also translated as Drain in Breath of Fire III and IV. マレクタ Marekuta Drain Also translated as Leech Power in Breath of Fire III and IV. カテクト Katekuto Fort Also translated as Def-Up in Breath of Fire II and Protect in Breath of Fire III and IV. ミカテクト Mikatekuto FortX Also translated as Def-UpX in Breath of Fire II and Shield in Breath of Fire III and IV. ハサート Hasaato Ag-Up Also translated as Speed in Breath of Fire III and IV. カトマナ Katomana Wall Can be found as an unused spell in Breath of Fire II. ナシバリ Nashibari Hold "Shibaru" is "to bind", while "Kanashibari" is how the Japanese refer to sleep paralysis. ヒュール Hyuuru Warp Also translated as Shift in Breath of Fire IV. エスカペ Esukape Flee The spell's name is a corruption of the Japanese pronuntiation for "escape" (エスケープ, esukeepu). ひっさつ Hissatsu Deathblow Slam Unlike later games, this is also used by enemies. Also translated as "Special" in Breath of Fire II and "Critical" in Breath of Fire III and IV. はんげき Hangeki Counterattack Cntr Also translated as "CtrAttck" in Breath of Fire II, "Reprisal" in Breath of Fire III and "Counter" in Breath of Fire IV. れんぞく Renzoku Continuous Cont An exclusive action performed by Gobi and Mogu. Note: These are the internal names of the dragon attacks performed by using the "Attack" command, and as such they can only be seen through hex editing. カケイ3 Kakei3 Immolation 3 Fire The FlmDr attack. Kakei (火刑) literally translates as "burning at the stake" or "execution by burning". コオル1 Kooru1 Freeze 1 Ice The SnoDr attack. デンゲキ1 Dengeki1 Electric Shock 1 Thander (sic) The ThrDr attack. カケイ5 Kakei5 Immolation 5 Flam (sic) The FlmDgn attack. コオル4 Kooru4 Freeze 4 Freeze The IceDgn attack. デンゲキ4 Dengeki4 Electric Shock 4 Volt The BltDgn attack. ゾハデス Zohadesu ZomX The GldDgn attack. インセキ Inseki Meteorite Comet Rudra's attack. デンゲキ Dengeki Electric Shock BoltX Agni's attack. いんせき2 Inseki2 Meteorite 2 Comet Refers to Tyr's "BigCrash" attack. デンゲキ5 Dengeki5 Electric Shock 5 Bolt A non-damaging spell, using it summons the lightning effect featured when Ryu transforms into a dragon. ボムド Bomudo Bombed Bom (sic) Two unfinished spells with a similar all-white effect to the NovaX spell. フブキ Fubuki Snowstorm Ice A generic ice-based spell, likely intended as an enemy-only counterpart to the generic fire-based spell described above. ちんもく Chinmoku Silence Silent This spell has the same effect as the Hush spell, so it was likely intended as the enemy equivalent of said spell. マホウMAX MahouMAX Magic MAX MP MAX This spell has the combined effect of Fort and Shield, with the added benefit of increasing the MAG stat to max. ドラグニール Doraguniiru Dragnier Drogen Also translated as "Dologany" in Breath of Fire II. ウィンディア Uindia Wyndia Winlan Also translated as "Windia" in Breath of Fire II. ロメロむら Romero Mura Romero Village Romero Named after zombie film director George Romero. タタールむら Tataaru Mura Tatar Village Tantar Its Japanese name is written in the same way as the Tatars, an ethnic group from Asia and Europe. パスラのうきしま Pasura no Ukishima Floating Island of Pasura Agua The Pasura sutta is a minor sutra or scripture in Buddhism canon. In English, "agua" is Spanish for "water." きょじん Kyojin Giant The Giant Translated "Stone Robot" in the game script. ひかりのまち Hikari no Machi City of Light Auria Its English name is derived from Aurum, Latin for "gold". ひかりとやみのとう Hikari to Yami no Tou Tower of Light & Darkness L & D Tower Translated "D.Keep", and "L.Keep" in some instances, in the game script. おんがくのくに Ongaku no Kuni Country of Music Tunlan The English version is likely a contraction of "Tune Land". ナバルのしろ Nabaru no Shiro Nabal Castle Nabal Likely based on the word "Naval" (ナヴァル, Navaru), given the castle has access to the sea. してんのうけんきゅうじょ Shitennou Kenkyuujo Four Devas Laboratory Lab. むまのとう Muma no Tou Incubus Tower Devil Tower Muma (夢魔) translates literaly as "dream demon", but its often used to refer to the Incubus, a male mythological demon who preyed on dreams. てんのとう Ten no Tou Heaven Tower Spyre Also translated as "SkyTower" in Breath of Fire II. じくうのとう Jikuu no Tou Spacetime Tower Tock In English its named after a clock's ticking sound, "tick-tock". ていと Teito Imperial Capital Scande Also translated as "Chedo" in Breath of Fire IV. りゅうのほこら Ryuu no Hokora Dragon Shrine Dragon Shrne (sic) This name is used in the first two dragon test temples. りゅうのしんでん Ryuu no Shinden Dragon Temple Dragon Tmple (sic) This name is used in the third dragon test temple and the secret temple under the Ease Cave. かくしべや Kakushi Beya Hidden Room Hidden Room Refers to rooms hidden in digging spots and sealed doors. Nameless Place Nada An unused location found in the internal list of city names, "nada" means "nothing" in a number of languages. It may be related to the unused ruined dragon temple only accessed through the DrWarp.